A lot rides on lady luck when you’re in Las Vegas. She can stack the cards in your favor or keep dealing you duds. She can up your odds at the table or she can give the edge to the house. Outside of the casinos, however, lady luck doesn’t have that same kind of pull. Drive about 15 miles southeast of the Vegas Strip to Henderson, Nev., home to VSR Industries, and you’ll find that success isn’t made by blowing on a pair of dice. It’s developed over time with a deep understanding of the market, calculated business decisions and a willingness to invest in employees and capital equipment upgrades. VSR Industries was the first company to create a metal slot base for cruise ships needing to adhere to new Coast Guard regulations. That combination of smart business strategies has earned VSR 70 percent market share for casino security and gaming products, including dimple locks, slot bases, slot cabinets and turnkey slot machines. The company has offices around the United States as well as in Mexico, Africa and Macau. Recently, the addition of a second manufacturing facility in Atlanta was announced, slated to open in July 2019. VSR got its start in 1969 by helping those who were unlucky enough to find themselves locked out of their house, car or business. Vegas Security Lock and Safe, as it was called, was also a security company with customers that relied on the company for their safes and lock boxes. Eventually, that customer list included a majority of the casinos in Las Vegas. Dimple locks are used on slot machines for the main and belly doors and are also used to protect the area where the cash box and CPU are housed. 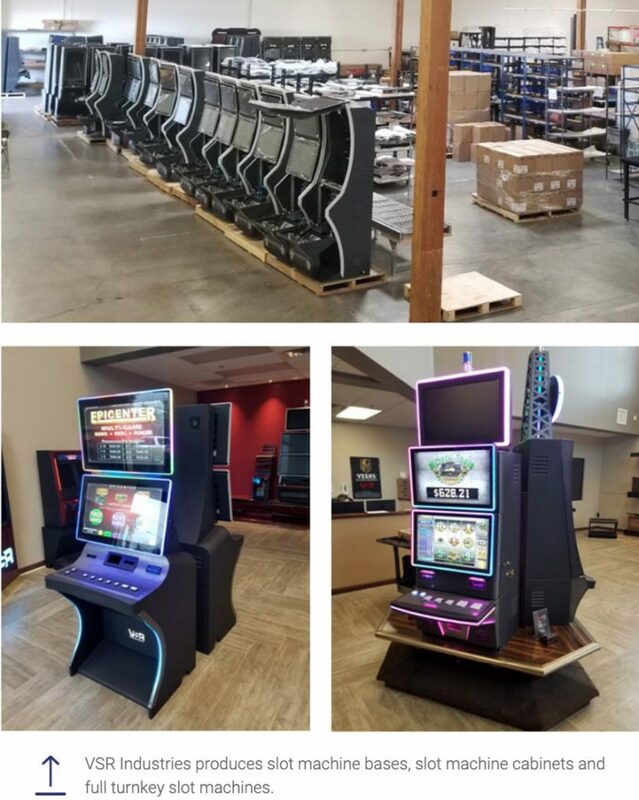 As gaming continued to expand, VSR began building the slot machine’s base, which supports the machines and the routing mechanism to conceal electrical and communications wiring. To produce the bases, the company launched a sheet metal manufacturing department. As its reputation grew, customers began asking VSR to make more than just locks and slot bases. Soon, drop boxes, cash transport equipment and full gaming cabinets were added to the product mix. Early on, VSR was producing about 400 slot bases each month. Today, the company produces about 4,000 each month or about 50,000 per year. To accommodate that growth, the company had to invest in the proper metal fabricating equipment. To produce its slot bases and full slot machine cabinets, VSR uses a range of sheet metal materials and thicknesses, primarily plated 14- to 16-gauge steel. As with any housed electrical product, the bases and cabinets require holes for wires and louvers to release heat. Therefore, a laser and punch were first in line as far as equipment investments were concerned. 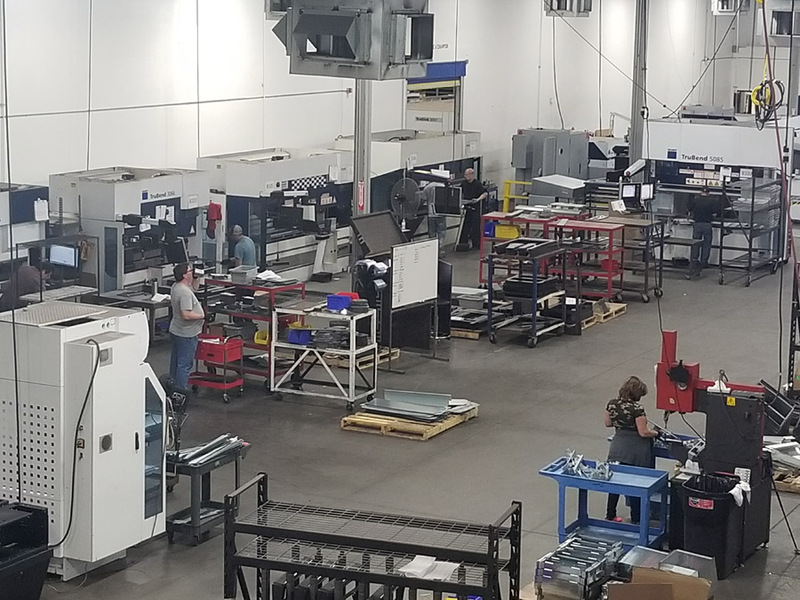 At VSR’s Henderson facility, full-swing manufacturing started with a Trumpf TruLaser 2030 CO2 laser and a TruMatic 2020 punch. 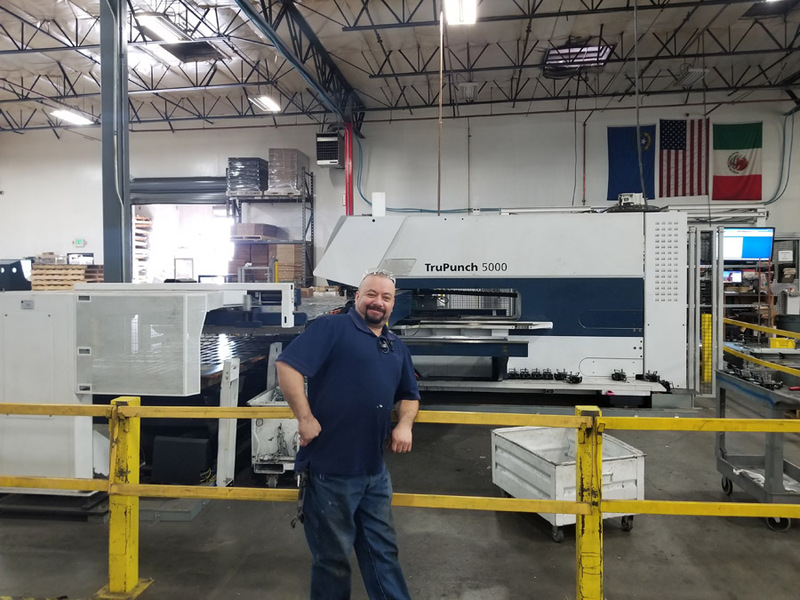 Soon thereafter, the company’s increasing demand propelled it to upgrade its punching capabilities with the addition of a TruPunch 5000 with a 20-shelf material handling tower. VSR’s two TruMatic 1000 fiber laser/punching combination machines offer the speed and precision expected of a fiber laser but also the ability to sort and drop parts into buckets below the machine. Thanks to the sorting feature, finished goods can go straight from the TruMatics to assembly or downstream forming. At its Henderson facility, VSR has 160,000 sq. ft. of space, but every inch of it must be leveraged to the fullest degree. 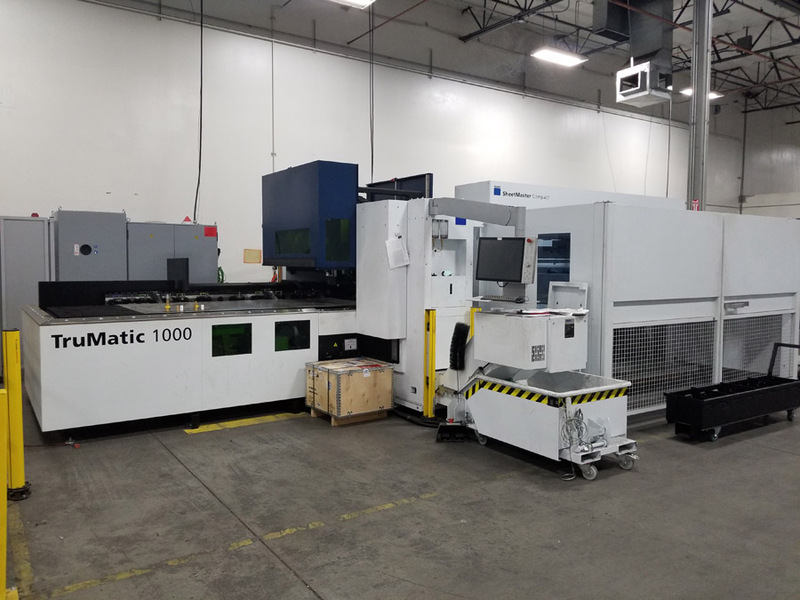 Fortunately, the TruMatic 1000 is incredibly efficient in terms of its footprint and processing capabilities – the latest model is 24 percent smaller than its predecessor. Handling multiple processes – cutting, punching, marking, bending, forming threads and sorting – is key to the company’s lean philosophies. Automatic unloading of microjoint sheets and scrap skeletons is an added bonus. Sergio Felix, a machine operator at VSR Industries, stands in front of a TruPunch 5000, a key piece of equipment for the company. 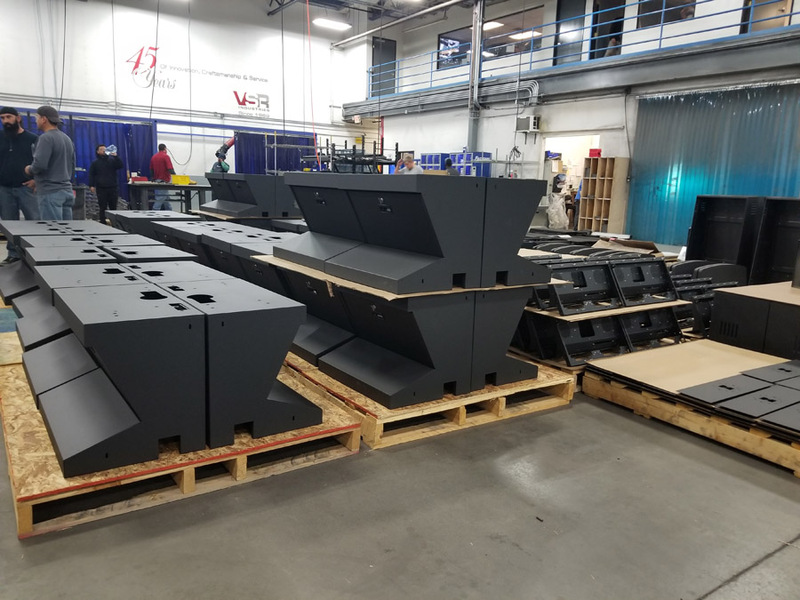 In addition to the work happening on its punching, laser cutting and combo equipment, VSR leverages several Trumpf press brakes for bending while a variety of manual and robotic welders join materials to later be powder coated and assembled in-house. Another TruMatic combo machine is currently on order to be delivered to the company’s new 30,000-sq.-ft. manufacturing facility in Atlanta. VSR’s commitment to the Trumpf brand is based on a combination of ideas. The sophistication of the equipment was an initial selling point, but the equipment manufacturer’s willingness to truly partner with its customers sealed the deal. VSR Industries relies on its TruMatic 1000 for its multiple processing capabilities as well as its small footprint. Automatic loading and unloading is also key. Las Vegas is known for its top-notch service, which for most folks is a major perk. For companies like VSR, however, the service-heavy job pool creates challenges when trying to fill manufacturing positions. Coincidentally, that leaves the company relying on Trumpf for service-related assistance, such as training and technology implementation. “These are large investments, and we want to make the most of those investments, which means our employees need to understand how to operate them right out of the gate,” Vollmann says. “Trumpf is incredibly comprehensive in the training they offer, which is important considering we’re at a little bit of a disadvantage when it comes to hiring in an area of the country where there’s not a lot of manufacturing, especially in sheet metal. But VSR’s service needs don’t stop at equipment training or software troubleshooting. The company will ultimately lean on Trumpf in a consultative capacity, as well, to help implement VSR’s recent investment in Trumpf’s TruTops Fab, a total-solutions software package that controls end-to-end fabrication operations. While a lot has changed at VSR since its days as a simple locksmith and even in the past few years – tenfold increases in output, more than double the staff and a new fleet of equipment – a lot of transformation is still to come. That means VSR’s lucky streak will continue, not that it needed any luck in the first place.